To be completely honest, we did not start the adoption process wanting to do open adoption. We thought we would do what a lot of people do, which is semi open. You meet the birth mother a couple of times before the birth, see her at the hospital and then meet maybe once or twice a year (or not at all) and send updates via email. We were scared of open adoption. Like many people who seek to adopt a baby, we wanted to only think of our baby as part of our family. But life is not that simple and that expectation is unrealistic because it’s not true. No matter the relationship or level of openness you have with the birth family, your child is still a part of their family. They still love them and they will be forever linked genetically to that family. That doesn’t make them any less your child. Any adoption, whether domestic and open, semi open or closed, international, or from the foster care system is a commitment to love and raise a child whose life started with a connection to their birth mother. No matter how you became their parents, they are your child. No type of adoption is better than another and all have their own challenges. God prepares everyone for their own journey and this is the one He chose for us. When we first met MacMillan’s birth mother, let’s call her Sarah, she was very excited to meet us. We were very nervous and I felt like I probably didn’t show my level of excitement about being picked. I was thrown off guard by her request for me to be in the delivery with her. Don’t get me wrong, I wanted to be there, I just thought that was not something I would get to experience. Sarah was very sweet and told us that she knew from the beginning of the pregnancy that she would have to place MacMillan for adoption. Without discussing her personal information, I will just state that she was not able to parent for a couple of reasons. I want to stop right here for a second and discuss the perception the general public has of birth mothers. It makes me angry when people ask me why would Sarah place MacMillan since he is so cute. Really people?! Yes my son is adorable, probably the cutest baby ever to be born (just a little biased), but his looks did not determine why his birth mother placed him for adoption. Placing MacMillan for adoption was a hard decision. She knew that she should do it because she wasn’t able to give him the life she wanted. Not all birth mothers are drug addicts or looking for a big pay out for their babies. They are mothers who realize that the life of their child is more important to them than what people think of them. They are mothers who want what is best for their child. They are mothers who sacrifice all that is in them to place their child in the arms of another mother so their child can have the life that they couldn’t provide for them. So when you think about birth mothers, throw away your negativity and think what you would do for your own child if you weren’t able to care for them. Alright, back to open adoption. Sarah and I had a great connection from the start. She asked that we be able to go to a local pregnancy center to see our son on a sonogram. This was an amazing experience. We met a couple of times with the adoption agent after this and she asked that I go with her to one of her doctors appointments. This was the best news ever. Again, I never thought I would be able to be this involved. Our adoption agent felt that we were doing really well together, so the next appointment I took her by myself. 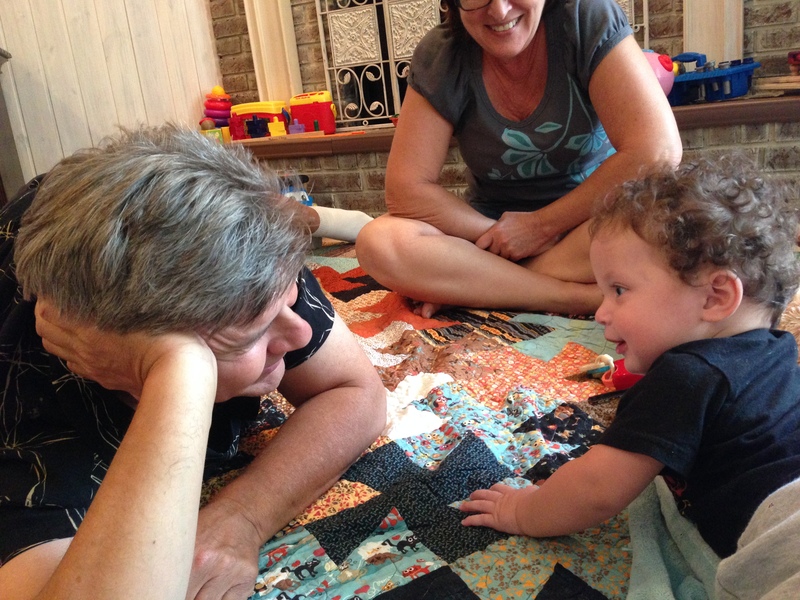 Sarah is blessed to have parents who are very supportive of the adoption process. We met with them as well. Even though our open adoption is with Sarah we agreed to involve them, since this is what she wanted. After meeting with them we got a better idea of why Sarah could not parent and we started to really love them as a family. As time went on and the countdown to delivery got closer the bond we had got stronger. She called me early in the morning in November and later that day our son was born. When she told the nurse that I should hold him first, the bond we had grew even more. We were both MacMillan’s mother, each in our own way. Her selfless love for her son made me a mother. My love for MacMillan gave her the ability to provide the life she wanted for her son. Our time in the hospital was good but of course it was full of mixed emotions for her family. We tried to respect them as much as possible and she allowed me to stay one night with her to bond more with MacMillan. When we left the hospital I was so full of joy that we were finally a family but I was very aware of the heartbreak Sarah felt by letting him go. During the first couple weeks I didn’t know how I was going to handle being one of two mothers. I wanted to do it, but with my new baby finally in my arms I didn’t know how I could do it. Prayer and the commitment I had made to Sarah and her family drove me to find a way to open my heart. We had agreed to wait to meet up until MacMillan had plenty of time to attach properly to us as his parents and for them to have time to heal. We shared pictures with them and sent a couple of messages back and forth. Then when MacMillan was about 3 1/2 months old we made plans to come over to their house to see them. At our first meeting, I was a little nervous about how the meeting would make me feel. Sarah and her parents were very respectful of our family unit. Their respect and obvious love for MacMillan made it easy for me to want to share the memories and moments of the past months with them. I think the time that we stayed apart gave us all time to deal with our feelings about becoming a family. Because when you have an open adoption that is what you are, family. Their family is a part of ours. We have been happy to include them in the milestones MacMillan has accomplished, as well as having them be a part of his baby dedication at our church. At Mother’s day we met up with Sarah and with her mom who we call Mimi. Just today we met with them again for father’s day so that MacMillan could spend some time with PaPa. 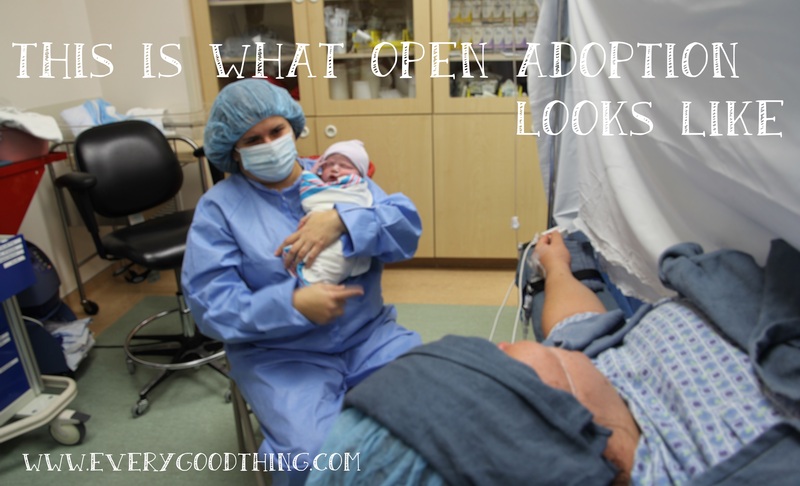 Open adoption is opening you heart to love your child’s birth family. We love them through the ups and downs, just like our biological family. Only God could prepare our hearts for this journey and oh what a journey it has been.